An intimate group of artists, film makers and wine lovers gathered Thursday in a Miami art gallery to sample a product you wouldn’t normally associate with the Mandela name. 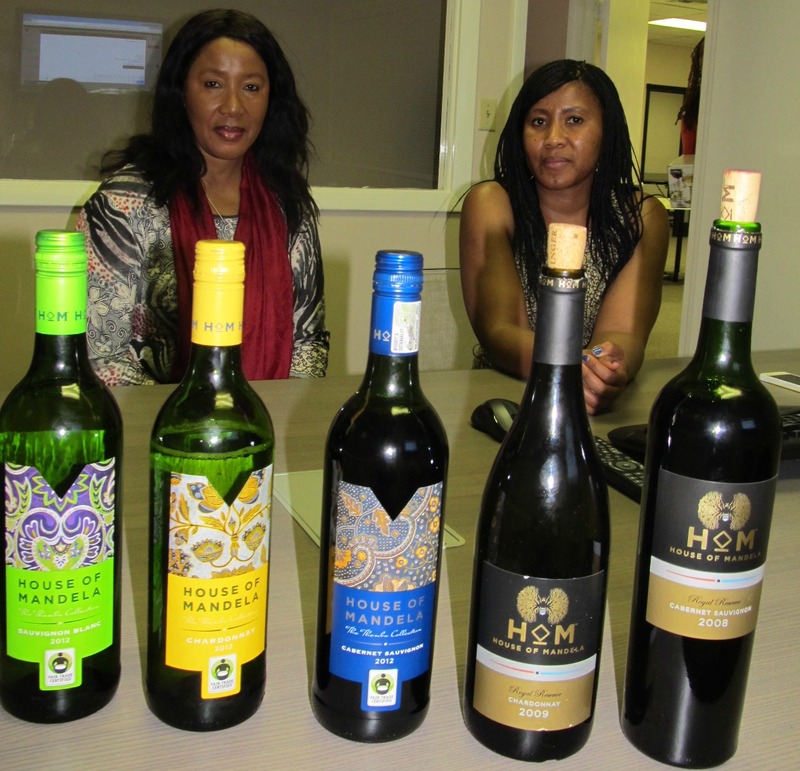 House of Mandela wines is a South African company run by Makaziwe “Maki” Mandela and Tukwini Mandela, daughter and granddaughter of Nelson Mandela. Their famous name has opened doors for them in what is a first entrepreneurial effort for both, they told AfkInsider. They launched the company in 2010. A Fullbright scholar, Makaziwe earned a doctorate in anthropology from the University of Massachusetts. She has worked to promote the role of women in a changing South Africa, and helped develop an investment portfolio in Nozala, a women’s investment group there. She has also served on the board of companies including Nestle and worked for academic institutions at home and abroad. Makaziwe was born in Johannesburg in 1954. Born in the Cape in 1974, Tukwini was raised by her maternal grandmother, Evelyn Mase, until age 10 when she moved to the U.S. with her parents. She arrived speaking no English but learned quickly, graduating from Amherst High School and returning to South Africa in 1994. With a degree in social work from Wits University, advanced education in advertising and work experience in advertising and marketing, Tukwini now serves as marketing director for House of Mandela. “We weren’t experienced in the wine business but we were prepared to learn,” Tukwini told AfkInsider. But it’s the story behind the name, the family and women’s pride in breaking into an industry dominated until recently by white males that is clearly driving their effort. Mandela mother and daughter were in Miami as part of a New York-Washington, D.C.-Miami tour to promote their line of House of Mandela Royal Reserve and Thembu Collection wines. Makaziwe Mandela and Tukwini Mandela held a wine tasting for their House of Mandela wines in Miami. While they do not own a vineyard or grow their own grapes, the Mandelas get their wines from some of South Africa’s best farms. For example, their Royal Reserve chardonnay hails from the world-renowned Thelema Mountain Vineyards in the Stellenbosch area. Less than 1 percent of wine sold in the U.S. is South African, Makaziwe told AfkInsider, and the Mandelas want to change that. But the story is not just about South Africa. Outside Africa, House of Mandela wine is sold in China, Brazil and Canada. In the U.S., you can buy it in some states at Whole Foods, Target and Total Wine, according to Publicist Yvette Harris of Harris Public Relations in Miami. Inside Africa, House of Mandela wine is sold in South Africa, Ethiopia, and soon in Kenya. South African wine is hardly new on the world stage but it is good and getting better. What is new in the South African wine scene is black South African women growing grapes and selling wine; women like the Brutus sisters, vintners from the Seven Sisters winery. Earlier this year Seven Sisters signed a deal to supply wine to 500 Walmarts. Camille Coke, a Miramar resident and Broward County attorney, was a guest at Multitudes Gallery in Miami Thursday. She met the Mandelas and tasted the wine. In the U.S., Heritage Link Brands is the exclusive importer of House of Mandela wines. It’s a small, family-owned company based in Los Angeles. Selena Cuffe is the CEO. She founded the company with her husband Khary in 2005, hoping to transform select African products into iconic, global brands. Carole Solomon of Heritage Link has been touring the U.S. with the Mandelas promoting their wines. The story of House of Mandela is one that resonates with Americans, said Solomon, whose own family was deeply involved in the U.S. Civil Rights Movement. The Mandelas said they hope to use House of Mandela for education, encouraging more blacks to get into white industries. They also hope to raise awareness of AIDS. “My brother died of AIDS,” Makaziwe said. Tukwini put it this way: “We are producing a product with a soul,” she said. Makaziwe said she hopes Americans will use House of Mandela wines in celebration, and with it, share their own stories. Image Attribution: Tukwini and Makaziwe Mandela, (center) granddaughter and daughter of Nelson Mandela, are interviewed in Miami during a wine tasting for their House of Mandela wines. AfkInsider photo by Dana Sanchez.